Storage System Integrator (SSI) Company Limited is a company registered in The Kingdom of Thailand since 2000 . SSI is leading in Design/ Project Management/Maintenance/Inspection the Warehouse Storage Rack System Material Handling System and Canvas tent in Thailand, SSI activities included Engineering design, Turnkey Construction, Installation,Project Management, Testing, Commissioning , Inspection and Maintenance. 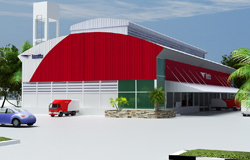 The project that already executed starting from Warehouse, Construction to Automated Warehouse (AS/RS) Construction.